"Roller Coaster" was played for the first time this year and "I'd Die For You" made its second appearance of the tour. If you'd like to share any videos from Milwaukee (especially "I'd Die For You" 😉) feel free to link to them in the comments. I'm happy to see "Knockout" gone again despite my affection for This House Is Not For Sale overall, and I think "Raise Your Hands" is a stronger choice for that second spot. "When We Were Us" was also back in the set, having not been performed since the Rock and Roll Hall of Fame induction. I’m behind the stage as a gift from someone, so aside from a perfect view of their asses, I can see the entire crowd. It’s very rough going so far aside from the SWW and NJ numbers. “It’s My Life” plays like the mega hit it is. Now it’s “We Weren’t Born To Follow”. People back in their seats and on their phones. I adore “Make a Memory” but it’s not a great encore song. “Wanted” without Richie’s harmonies is blasphemous. In the end, most people formed over $100 to hear “Livin’ on a Prayer” which has the place on their feet. "Knockout" was back (*sigh*), and only two This House Is Not For Sale songs were played. Bon Jovi's Atlanta show brought with it a couple of changes. "In These Arms" and "New Year's Day" were played for the first time this year, the latter replacing "God Bless This Mess". "We Don't Run" stayed in the spot that "Knockout" had occupied for most of the tour (which is fine by me, since I've said a few times that "Knockout" is my least favourite song on This House Is Not For Sale). Bon Jovi was inducted into the Rock & Roll Hall of Fame Class of 2018 on April 14. Then & now: Dave, Alec, Jon, Tico, Richie. Howard Stern's hilarious, NSFW speech included such glorious soundbites as "Bon Jovi beats sperm". After Howard's introduction, the inducted band members each got to speak. Alec John Such went first, followed by Hugh McDonald, Richie Sambora, Tico Torres, David Bryan, and finally Jon Bon Jovi. The speeches ranged from the emotional to the nostalgic to the outright funny. I know Jon wanted to do a new song but "When We Were Us" was still a bit unexpected and, as far as I'm aware, a pretty unconventional choice for the Rock and Roll Hall of Fame (artists usually stick to their hits or most influential songs). It was great to hear Richie's harmonies though, and to see him and Jon singing from the same microphone. The official HBO telecast of the induction ceremony will air on May 5. Hopefully those of us not in the US will be able to watch it too. 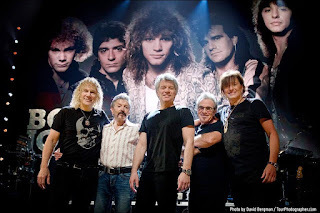 In case you missed it, Bon Jovi and the Moody Blues had made an appearance at the Rock Hall the day before the ceremony, with Jon giving a speech saying, "We're thrilled, we're honoured, and it's about f***ing time". Now I know there are plenty of fans who have harboured varying degrees of discontent with the state of Bon Jovi over the past few years. I'd be lying if I said I was completely happy about everything. But tonight that didn't matter. (I won't speak for anyone else, but it didn't matter to me.) Tonight was a celebration of what Bon Jovi's music has meant to me for so long. All the times they lifted me up, consoled me, saved me. And that history won't change, no matter what happens going forward. Bon Jovi's second of two consecutive nights in Newark brought with it a couple of nice surprises, namely "Runaway" in the main set (replacing "Have a Nice Day") and "These Days" and "Blood on Blood" in the encore. "These Days" was played for the first time this year. Richie Sambora was evidently at the Prudential Center but didn't make an appearance on stage. What has it been like rehearsing with the rest of Bon Jovi? It must bring back memories. RS: We played live to millions of people over 31 years. Do I miss it? No -- but the memories are good. It feels great to see everybody. We already rehearsed and it was wonderful, it wasn't awkward. The chemistry came back very quickly; it’s matrixed into our muscle memory at this point. If you’re on the road performing and touring for 30 years, [the Rock Hall ceremony] is just another cycle -- and it’s a good one, so here we go. You can read the full interview with Richie and Orianthi (The interview also covers RSO's upcoming album) here. "Runaway" was performed for the first time this year. The band has another gig at the same venue coming up tomorrow, before the Rock and Roll Hall of Fame induction ceremony in Cleveland this Saturday, April 14.